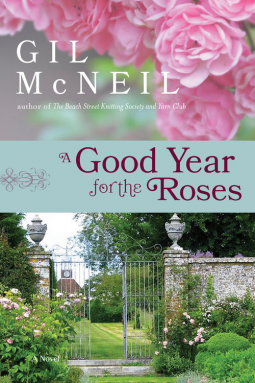 I received a copy of A Good Year for the Roses from Net Galley in exchange for an honest review. This is my favorite kind of book to read. I love books about regular women who just happen to live in the English countryside, complete with gardens that I would never have the patience or knowledge to tend. I had never heard of this author before, but I will be looking forward to reading her other books now. She was like a mix of two of my favorite English authors, Jane Green and Rosamunde Pilcher. Molly is a recent divorcee, but not extremely unhappy about this turn of events. She is dealing with the havoc of raising three boys on her own and selling her home when her great-aunt passes away. To the disappointment of her hotel owning family, she is the sole recipient of the her aunt's country estate, but it comes along with her eccentric great-uncle, and the cook and gardener that live on the property. The thing I really liked about this book was that there was no dramatic plot twist, just the story of how starting over isn't always bad, and how families can adjust and thrive in a new environment. I also liked that Molly didn't get taken in by the local smooth talking developer, who is faking an interest in her just to help her brother get his hands on the property. As a single mom of three kids, I could certainly relate to Molly's dread of having to take time out of real lift in order to get dolled up to go out on a date. People find it hard to believe you can just be happy when you are busy and surrounded by family and friends. This is where she was more like Rosamunde Pilcher than Jane Green - because Jane Green always wants true love to prevail. This book was relaxing chick lit at it's best. Loved it.